Amidst all the gloom and doom, there was a spate of good news for the economy today. Global ratings agency Moody�s upgraded India�s rating, FDI in single-brand retail was notified, the stock markets were up by more than 2 per cent, FDI flows went up by 56 per cent in November, the rupee hit a one-month high and indirect tax collections were up 16 per cent. Unpleasant action would follow if the government failed to implement the Supreme Court�s directive on the National Reconciliation Ordinance (NRO) by January 16, asserted Justice Asif Sayeed Khosa today while reading out the verdict of a five-member Bench looking into the government�s non-compliance. The court was giving the government �a last chance�, the court added. Prime Minister Manmohan Singh today described child malnutrition as �national shame� and said health, education and sanitation sectors must collaborate to shape national response to the problem. 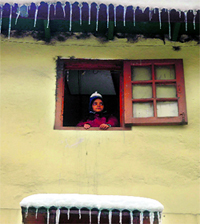 Biting cold prevailed in the Kashmir Valley with the mercury plunging to -16.2�C in Gulmarg while Srinagar shivered at -2.8�C. Manali -7�C It was a chilly Tuesday in Himachal with Manali shivering at -7�C while Shimla and Solan recorded a low of -2.1�C and -2.5�C, respectively. Bobby Jindal, the first Indian- American governor in the US and a possible contender for the White House in future, began his second term as the chief of Louisiana following a landslide victory. Leave politics to the politicians is what once bitten twice shy Sufi singer Hans Raj Hans has to say to artistes trying their luck in the political arena in the Punjab Assembly elections.